*note: i ended up doubling the recipe, i was hoping the layers would rise enough to slice in half but they didn’t. my end result was three layers, the fourth layer is being consumed separate. the recipe i post will be single. my adaption is lactose-free, and for one of the layers i used liquid egg whites which made the cake batter watery-er and it didn’t rise as much as the layers with actual egg whites. the taste is the same though. 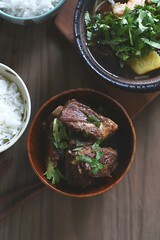 also, cook’s illustrated is legendary with their method on time, ingredients, blah blah blah. ain’t nobody got time for that. mix accordingly to common sense, bake based on how you know your oven, not on how far your pans can be from the wall and from each other. i’m just saying. hashtag this is me being ornery and eye rolling at CI. in the mixing bowl, add the flour, sugar, baking powder and salt. cream with the butter. it’ll look like sugar cookie batter. scrape down the bowl. in a pouring vessel, best is a glass measuring cup, add in the half&half with the egg whites, along with the extracts. mix until blended. pour half the liquid into the batter, mixing until well incorporated. scrape the sides of the bowl often. add remaining liquid and repeat mixing and scraping. pour batter into the prepared pans. bake for 27 – 30 minutes, until the cake pulls from the sides of the pan smidge, it’ll be a pretty golden on top and a toothpick will come out clean. cool on rack. i used a typical buttercream recipe, of vegan butter + powdered sugar + a few splashes of peppermint extract. i used these methods & inspiration for attiring the cake. 1. This cake is absolutely gorgeous, so who cares if you can’t decorate a tree? CAKE IS MORE IMPORTANT! 2. I wasn’t allowed to decorate our tree as a child. None of the children were permitted. Rosie/Martha Stewart simply couldn’t allow it. I recall that we had a “kids” tree for many years, but most years I went to a friend’s house to throw tinsel and ornaments around. For at that house, no one cared about spacing. you get me, you totally get me. now as an adult, even if i did want a tree, the clean up afterward is more than i can handle. I want a slice of this cake. It is stunning. wendi, you are kind, thank you. For someone who doesn’t celebrate Christmas, you’ve done a phenomenal job with this cake. It’s pure ethereal beauty, I’m so in love with it! That icing would have taken me forever. And I completely understand about the lackluster Christmas feelings — my boyfriend adores Christmas, but my childhood associations with it have never been fantastic. We’re changing that this year, since it’s our first Christmas together. Maybe I’ll make this cake 🙂 Thank you for sharing this gem. here’s to new traditions! this is our first christmas as husband/wife and we’re all about creating new moments to remember. fwiw, it took me three tries to get the lights on our tree where they were spaced out and not all crowded around the middle. after that, my kids decorated the tree and have been redecorating it every day since. it isn’t pretty but it makes them happy. and i can’t ice a cake to save my life. seriously, i make the ugliest cakes ever. yours however, is lovely! amanda, your everyday tree decorating sounds lovely and SO HAPPY. i’m glad. But you don’t need a tree. You only need cake! Cake makes everything a celebration! 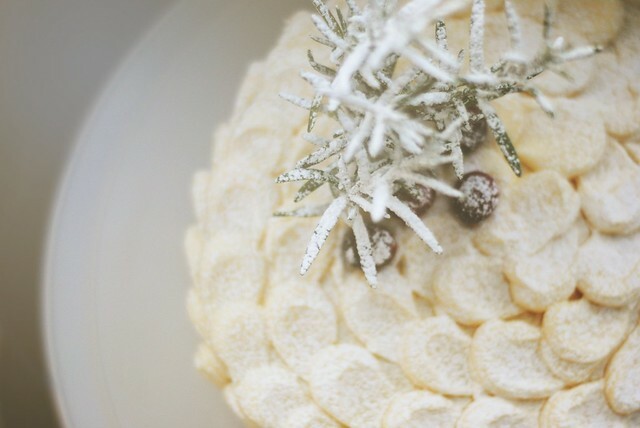 I pin cakes regularly for inspiration but I dont think I’ve seen a wintery cake more pretty, like, ever. Are those snowy rosemary trees?! GAH! You are the master. I salute this cake. cake does make everything better, especially if everyone eating it likes it. you know, i have selective memory, i know this and this particular memory is one that i can recall very vividly. i’m sure there are happy memories of my stepmother, i’m just not recalling them right this second. Valerie, you are so sweet, coming from a celebrated baker like yourself, thank you! 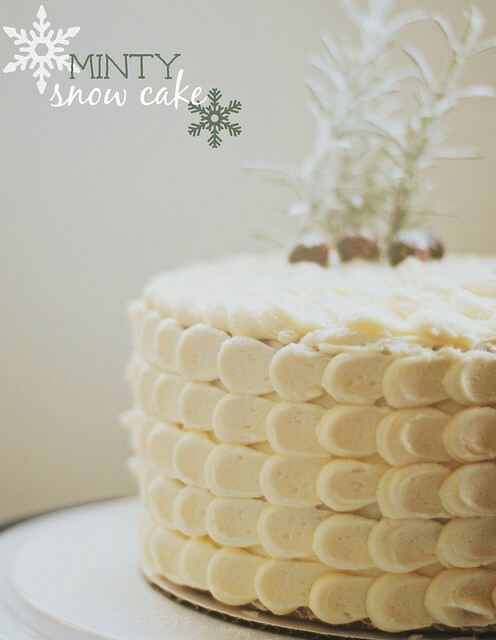 Such a gorgeous, snowy cake!